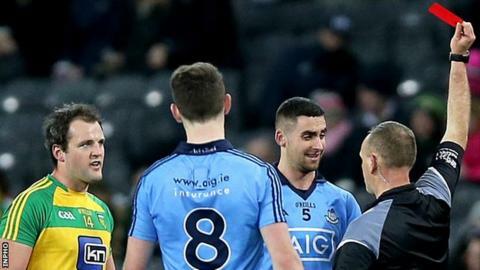 Dublin's James McCarthy could be facing a ban after appearing to put a finger into the left eye of Donegal's Martin McElhinney in Saturday's League game. McCarthy became involved in a scuffle with McElhinney after Donegal captain Michael Murphy had produced a sliding challenge on Ciaran Kilkenny. TV footage showed McCarthy appearing to make contact with McElhinney's eye. The GAA will first wait to see whether the issue is mentioned in referee Conor Lane's match report. If the incident wasn't spotted by the referee, it's possible that GAA disciplinary bosses could opt to use video evidence. Dublin defender Philly McMahon was handed a one-match ban following last year's All-Ireland Final after GAA disciplinary bosses ruled that he had made contact with the eye area of Kerry's Kieran Donaghy. Both Murphy and McCarthy were sent off after they received second yellow cards following the two incidents in Saturday night's game at Croke Park. Donegal manager Rory Gallagher was unhappy with Murphy's dismissal, claiming that his captain is "refereed differently" to other players.